Push up bars are made of good-quality engineering plastics, which is hard enough to support any weights. The material of main construction engineering plastics is very sturdy and durable. Slip-resistant foam is used as push up handles is so soft that users can hold comfortably. Not only are pushup handles lightweight and easy to carry everywhere, like work, home, office or to the gym, but can also be dis-assembled and can fit in the smallest of places and bags for convenience. Take these everywhere you go. 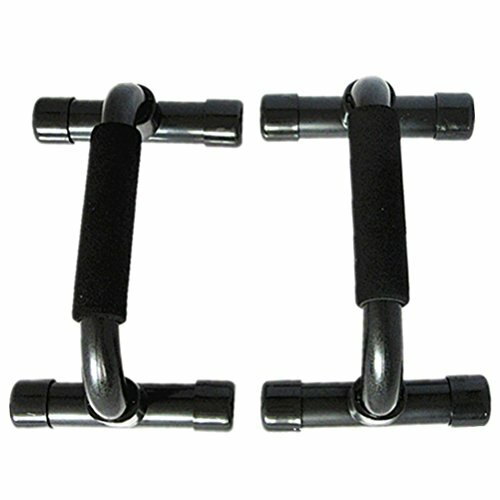 - Push up bars are made of good-quality engineering plastics, which is hard enough to support any weights. The material of main construction engineering plastics is very sturdy and durable. - Slip-resistant foam is used as push up handles is so soft that users can hold comfortably. - Not only are pushup handles lightweight and easy to carry everywhere, like work, home, office or to the gym, but can also be dis-assembled and can fit in the smallest of places and bags for convenience. - Using the push up bars can help in muscle training. Push up workout with push up bars can train your chest, shoulders, triceps and back muscles. It is suitable for man or woman to do pushup workout or muscle enhancement. Push up bars are made of good-quality engineering plastics, which is hard enough to support any weights. The material of main construction engineering plastics is very sturdy and durable. Slip-resistant foam is used as push up handles is so soft that users can hold comfortably. Not only are pushup handles lightweight and easy to carry everywhere, like work, home, office or to the gym, but can also be dis-assembled and can fit in the smallest of places and bags for convenience. Using the push up bars can help in muscle training. Push up workout with push up bars can train your chest, shoulders, triceps and back muscles.